How Are Fan Blades Inclined Planes? Inclined planes are really little more than simple flat objects turned at an angle to become a simple machine. The plane may be turned to any angle as long as it is not a right angle, as a right angle would make the plane nothing more than a plane on a different axis. When the plane is inclined, it allows a motor or other input to produce work with considerably less effort than would be required using direct force, as the incline of the plane overcomes vertical or horizontal resistance by displacing it much like a lever would do. To be considered an inclined plane, a simple machine needs only to be flat, inclined, and useful for producing work with reduced input. By their very nature, fan blades are inclined to an angle of less than 90 degrees. When a fan motor turns the blades, the blades move through the air at an incline; the inclined surface passing through the air pushes the air forward, as the air is scooped up by the leading edge of the fan blade and set in motion as it passes over the surface. In a standard box, oscillating or fixed fan, the motor constantly turns the blades in a single direction to direct air out the front of the fan fixture. In a ceiling fan, the direction of movement can be adjusted to alter the flow of air. During periods of hot temperatures, the motor can spin the blades clockwise to direct air downward; the resulting movement of air allows a slight breeze to pass over human skin and produce a cooling effect. 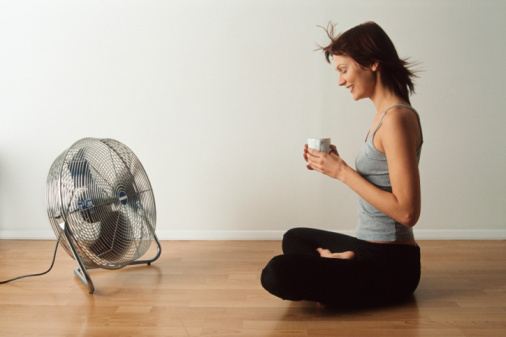 In cooler times, the fan motor can be adjusted to rotate counter-clockwise; the blades force cool, heavy air upward to displace warm air and heat the room in which the fan is installed. As a fan spins and the attached blades move, they produce the "work" of displacing large volumes of air. Certainly, movement of air by direct pressure, as would be produced by a pump, would require considerably more energy than a typical fan motor is capable of outputting. Because the fan blades are flat surfaces, set at an angle and used to produce work with reduced effort, they meet all definition requirements to be considered an "inclined plane." How Does Topography Influence Weather?